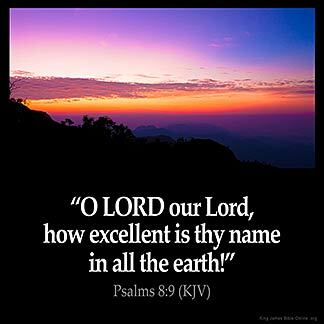 PSALMS 8:9 KJV "O LORD our Lord, how excellent [is] thy name in all the earth!" 6Thou madest him to have dominion over the works of thy hands; thou hast put all things under his feet: 7All sheep and oxen, yea, and the beasts of the field; 8The fowl of the air, and the fish of the sea, and whatsoever passeth through the paths of the seas. 9O LORD our Lord, how excellent is thy name in all the earth! O Jehovah, our Lord, How excellent is thy name in all the earth! Psalm 9 For the Chief Musician; set to Muthlabben. A Psalm of David. O Lord, our Lord, how noble is your name in all the earth! Jehovah our Lord, how excellent is thy name in all the earth! (8:10) O LORD, our Lord, how glorious is Thy name in all the earth! The Name of the Lord is Great and He is Greatly to be Praised. He is my Lord and His name is great in me. In the earth refers to me because I am made from earth. Praise God for His Wonderful name !!!! !